SIGNING OPPORTUNITY at the SAN DIEGO FESTIVAL OF BOOKS! 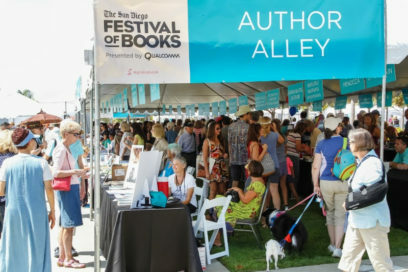 The San Diego Festival of Books will be held Aug. 25, from 10 am to 5 pm, at Venues Liberty Station (more information about the event here ). Last year’s inaugural festival was a great success, with more than 10,000 attending. This year’s should be even larger. Liberty Station is a beautiful venue, with plentiful eateries (and drinkeries), the perfect place to meet readers, sign books and help promote Mystery Writers of America. We will have a booth in Author’s Alley, with one-hour signing slots available from 10 am to 4 pm. To join, please email Lisa Brackmann and indicate your first and second choice of times and provide the title and ISBN of your most recent book. Mysterious Galaxy will handle trade-published works. Consignment authors are welcome to manage their own sales. Mysterious Galaxy will handle trade-published works. Your information must be received by Saturday August 4 for Mysterious Galaxy to have an opportunity to stock your books. Consignment authors are welcome to manage their own sales.